At first glance it might seem difficult to find two countries more different than Iceland and Japan. The ancient Land of the Rising Sun looks back proudly on thousands of years of history. Iceland, on the other hand, is relatively young, having only been settled by the Vikings in the ninth century. Japan is densely populated, and her people live crowded together in mega cities, while Iceland's sparse population is scattered over a wild and untamed landscape. But the two countries also have several things in common. Both are island nations with democratic governments and developed economies. And both sit on volcanic hot spots. Iceland sits astride the meeting point of two major tectonic plates. Consequently it is home to one of the world's most active volcanic regions, a belt of volcanoes, geysers, hot springs and lava fields which runs across the entire country1. Japan sits on the Ring of Fire, the seismically active perimeter of the Pacific Ocean where 90 percent of all the world's earthquakes occur. Japan is located at a particularly active section of this zone at the juncture of four constantly moving tectonic plates. The hazards of this location include living near active volcanoes and experiencing approximately 1,500 earthquakes every year2, with minor tremors being a casually accepted part of everyday Japanese life. This seismically active zone also brings with it a gift in the form of numerous onsens or hot springs, and a visit to the onsen is a much loved aspect of Japanese culture. The Earth's tectonic plates are continually in motion because they float on magma, an underground ocean of hot, molten rock. It has been estimated that the energy potential of the heat below our feet is 50,000 times that of all the world's oil and natural gas combined. In hot spots such as Iceland and Japan, water coming into contact with magma becomes super heated and rises to the surface as hot springs, geysers or steam. Hot water can be used directly for heating, while steam can be used to drive electric generators as shown in the diagram below. Thanks in large part to geothermal power, Iceland is blessed with abundant, cheap, clean energy. This small north Atlantic country produces the world's highest per capita amount of electricity, approximately 55,000 kilowatt hours of electricity per person. It is also the world's largest producer of renewable energy: 20% of its power is hydroelectric and 65% is geothermal. Not only that but according to Askja Energy corporation this is only 35% of the country's total energy production potential4. Iceland was an early pioneer in the use of geothermal energy. The country first used heated groundwater directly for central heating. Piped hot water was used for heating buildings in the capital city of Reykjavik in 1930. Now Reykjavik boasts the world's largest geothermal district heating system which serves 200,000 inhabitants, and 90% of all homes in Iceland are heated in this way. Direct heating is also used for greenhouses, swimming pools and fish farms, to melt snow, dry timber and seaweed, and for industrial production. Iceland also uses 37% of its geothermal capacity for the production of electricity from steam turbines. Development currently focuses on high temperature exploration to produce energy for the country's aluminum industry. Co-generational plants make efficient use of geothermal resources. Steam is used to generate electricity and then condensed into hot water and pumped through pipes for home heating. At the Svartsengi power plant in southwestern Iceland the hot water is reused a third time to create the Blue Lagoon, an award-winning spa where bathers can luxuriate in steaming, mineral rich water. The deeper the well, the hotter the water, and the greater the energy potential. Consequently, the Icelandic government is now collaborating with power companies on the Iceland Deep Drilling Project, a long-term feasibility study focusing on high-temperature hydrothermal systems. The plan is to drill and test boreholes to a depth of up to 5 kilometers in order to penetrate critical zones where the water temperature may be as high as 600 degrees C5. Japan sits on the world's third largest geothermal reserves and has developed a reputation as a world leader in geothermal turbine technology. It would therefore seem natural and logical that Japan would, like Iceland, develop its geothermal potential. However, the Japanese government made the problematic decision to meet the energy needs of this earthquake-prone country by building nuclear reactors. This decision resulted in a nuclear crisis when the 2011 Great Japan earthquake and resulting tsunami caused horrendous devastation to coastal areas and the meltdown of three reactors at the Fukushima Daiichi nuclear power plant. Radiation spread on land, contaminating the food and water supply, and continues to spread through the Pacific Ocean and around the world. Alarmingly, radioactive rainwater has been detected as far away as California7. Five years after the disaster the area around the plants remains uninhabitable. The energy company TEPCO is continuing with the cleanup, which may take up to 40 years and cost over $100 billion6. The government shut down all Japan's nuclear plants as, in an uncharacteristically Japanese display of raw emotion, a fearful public staged massive anti-nuclear protests. Obviously the country needed to find a viable alternative to nuclear power. Although geothermal power might seem an obvious choice, geothermal plants currently supply a mere 1% of Japan’s energy requirements. 86% of its energy is provided by imported fossil fuels. The remainder comes from two re-opened nuclear reactors9 as well as from hydro, solar, wind power and biomass (garbage burning)11. Japan had already taken steps towards developing geothermal energy long before the 2011 crisis. The first successful geothermal well was drilled by Mr. Masuji Yamauchi in 1919. The country began experimental geothermal power production in 1925, and the first commercially viable geothermal power plant in Japan opened in 1966. 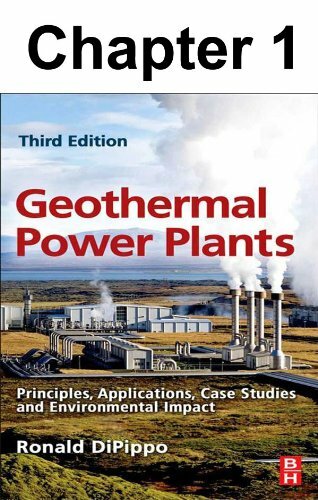 By 1996 total geothermal capacity reached 500 megawatts8. However, there were many roadblocks to further development. These including high exploration and start up costs and a lengthy development period combined with the fact that most prime sites are located in protected national parks10. Another major obstacle is Japan’s love of hot springs. Onsens are the heart of a $28.6 billion hospitality industry which has consistently opposed geothermal development9. Nevertheless, the Ministry of the Environment loosened restrictions on national park development in 201210. In 2014, the first new geothermal plant to be built in 15 years was opened at a popular hot spring destination on Kyushu by Chuo Electric, which hopes to open five more plants in the near future. Other companies are also planning geothermal developments in resort areas12. Although the environmental impact of geothermal plants is considerably less than that of fossil fuel or nuclear plants, there are still some concerns that need to be taken into account. The plants may create both water and air pollution. Atmospheric emissions include hydrogen sulfide, the “rotten egg” gas which can change into sulfur dioxide and cause acid rain. Some plants use pressurized water to fracture hot rocks, and this "fracking" process is known to cause earthquakes13. However, if these issues can be addressed, geothermal has a great potential to become the energy of the future. As stated above, it could provide 50,000 times the energy of earth's total oil and gas reserves. The demonstrated success of Iceland in geothermal energy production provides a model not only for Japan but also for other geothermically active areas of the world.